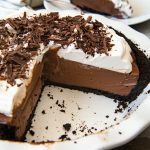 Rich, decadent chocolate custard topped with sweetened whipped cream and chocolate shavings inside a crushed Oreo cookie crust make this Chocolate Cream Pie a creamy, cool dessert that is guaranteed to please! Pulse the Oreo cookies in a food processor until coarsely ground, about 15 pulses, then continue to process another 15 seconds until they turn into fine, even crumbs. Drizzle the melted butter over the Oreo crumbs and pulse to combine. Transfer the cookie crumb mixture to a pie plate and press into an even layer on the bottom and up the sides, using the bottom of a measuring cup or drinking glass. Bake for 10 minutes, then cool completely before filling. In a medium saucepan over medium-high heat, bring the milk, cream, 1/4 cup of the sugar, and salt to a simmer, stirring occasionally. While the milk mixture heats, whisk together the remaining sugar, cornstarch, and egg yolks until smooth and creamy. When the milk mixture is hot, slowly pour 1 cup of the hot liquid into the egg mixture, whisking to temper the egg yolks. Then slowly whisk the tempered yolks back into the saucepan of simmering milk and cream. Reduce the heat to medium and continue to cook, whisking constantly, until the mixture thickens and large bubbles start to burst on top, about 30 seconds. Remove the pan from the heat and immediately whisk in the cubed butter and chocolate until completely melted and smooth. Stir in the vanilla, then pour into the prepared pie crust. Cover with plastic wrap, pressing into the surface of the filling so a skin doesn't form, and refrigerate for 4 hours until the filling is set and chilled. Using an electric mixer or stand mixer, whip the cream, sugar, and vanilla together until soft peaks form, anywhere from 1 to 3 minutes. Spread over the top of the chilled and set pie, then sprinkle with chocolate shavings and serve. 3 1/2 cups of half-and-half can be used in place of the whole milk and cream.